The city of Bologna is one of the most beguiling in Italy, with a wonderful medieval centre and some of the best food in the world. It’s home to the classic ragù sauce that most of the world calls Bolognese, and much more besides. Bologna is worth a few days of your time, but it’s also one of the best places to stay in northern Italy if you’re planning to use somewhere as a base to explore the region. Its location means that there are some amazing day trips from Bologna. It’s within reach of two of Italy’s ‘big three’ destinations, Venice and Florence. Closer to home, it’s the main city in Emilia-Romagna, one of the best food regions in Italy, home to the heavenly Parmigiano Reggiano, or Parmesan, cheese, and Parma ham. So if you can tear yourself away from the delicious food in Bologna, there’s plenty of outstanding food in Parma too, or you could take a Modena balsamic vinegar tour. Some of the best day trips from Bologna are close to the Adriatic coast, with Ravenna and Rimini especially worthy of the time, and another country, the tiny republic of San Marino, also close by. You can accomplish many of these day trips from Bologna by train, and venture even further by looking at tours from Bologna or car hire from Bologna. Padua – Padova in Italian – is reminiscent of Bologna in that it’s a fascinating old city with an ancient university and a large student population. It’s one of the main cities of the Veneto region, and the Bologna to Padua train journey takes as little as an hour. There are enough things to do in Padua to keep you there at least two days, but you can get around the main sights on a day trip from Bologna. You should book yourself a place on a tour of the Cappella Scrovegni, the interior of which was painted by Giotto da Bondone between 1303 and 1305, decorating it with a series of Biblical scenes. The heart of the city is around the Palazzo della Ragione and the two squares either side –Piazza della Frutta and Piazza delle Erbe, where busy markets are held on weekdays. These are a very short walk from the cathedral whose Baptistery has an amazing ceiling by Giusto de’ Menabuoi. It’s also worth stopping by at the Caffe Pedrocchi for coffee or food, before joining a guided tour of the University. 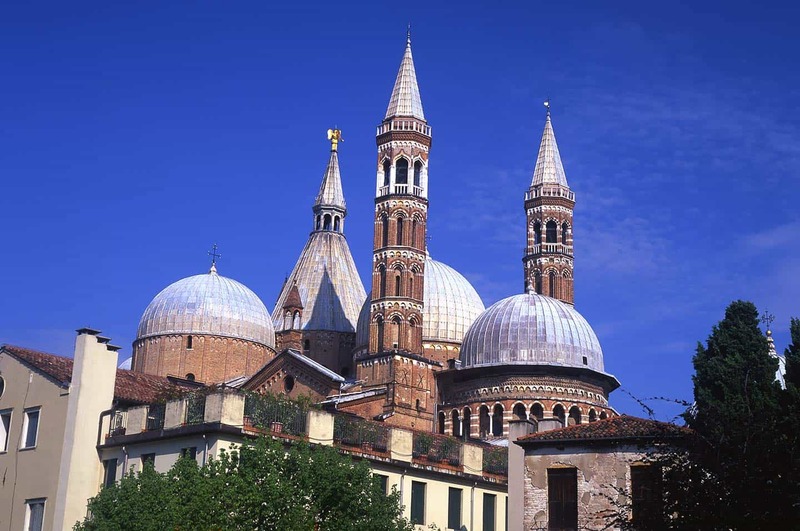 Padua’s other essential sight is Il Santo, the Basilica of St Anthony of Padua, one of the most opulent and fascinating churches I’ve ever visited. Anthony was a disciple of St Francis of Assisi who was canonised just three years after his death, and his devotional cult is very powerful, 800 years after his death. Getting there: An easy train journey, taking around an hour. There are so many things to do in Venice and a day doesn’t come anywhere doing it justice, but a Bologna to Venice day trip is feasible, and you can get a taste of it in the time available. It’s something you could easily accomplish by yourself – the train from Bologna to Venice can take as little as an hour and a half. Otherwise there are also plenty of day tours of Venice available. It’s surprising how much you can actually see in a day trip to Venice. After leaving Stazione Santa Lucia, head straight for the kiosks by the Grand Canal and buy a one day travel card (biglietto per un giorno), which currently costs €20. It’s expensive, but a big saving on buying single journey tickets at a time (an exorbitant €7.50). 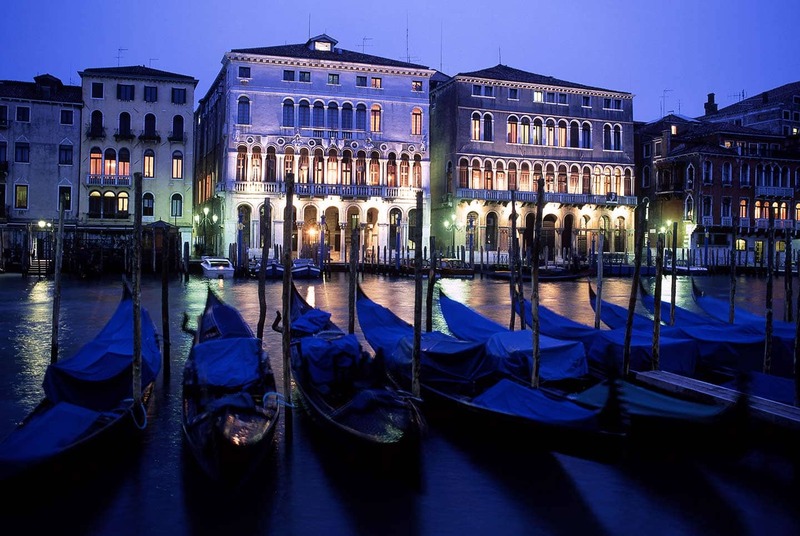 Then board the next available #1 vaporetto (waterbus) and travel the length of the Grand Canal, which takes 35 minutes. If you’re travelling by yourself you’ll need to be organised if you want to avoid wasting time in long queues, but you can book ‘skip the line’ tickets to St Mark’s (San Marco) Basilica, the Campanile and the Doge’s Palace. The area around Piazza San Marco (St Mark’s Square) is always packed with crowds. Our advice is to either catch another vaporetto (the number 2 crosses the lagoon to the beautiful church of San Giorgio Maggiore and continues to Zattere, a great place to start exploring the canals of Dorsoduro) or walk. Our 3 day Venice itinerary feature gives you some ideas on other things to see in Venice and has some wonderful walking routes. Getting there: A straightforward direct train, taking on average less than 90 minutes. Modena is the best of the cities near Bologna. It’s a very short hop away by train (between 17 and 30 minutes) from Bologna to Modena. It’s one of the best destinations in Emilia-Romagna, and there are a host of things to do in Modena, with enough to keep foodies, history buffs and petrolheads very happy. Most people know of the city because of its main food product, balsamic vinegar of Modena. 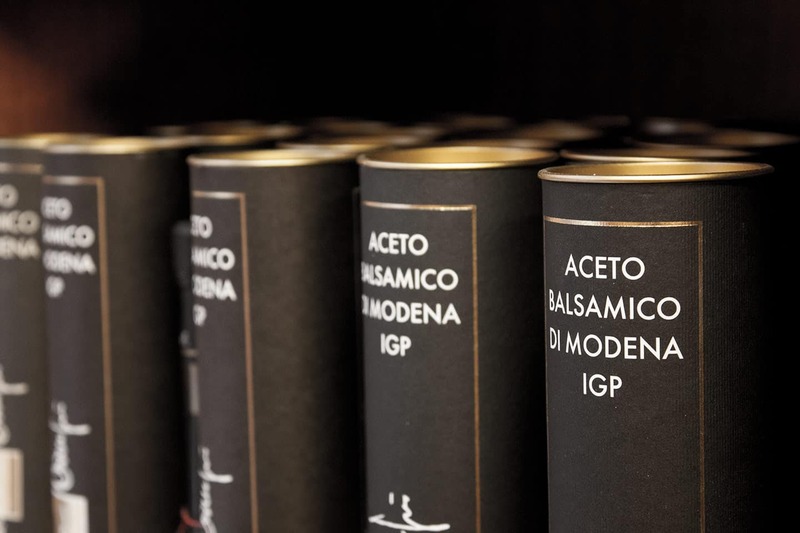 Forget what have tasted out of a bottle in a supermarket: some of the aceto balsamico tradizionale di Modena you can buy in the city and around is unrecognisable from this, far and away better. My wife Faye bought me a bottle for my birthday and it tasted so exquisite I didn’t want to consume it. Of course, I did, eventually, savouring every beautiful drop. It’s well worth seeking out a Modena food tour where you can visit an acetaia and sample some of the older aceto balsamico. The historic centre of Modena is another delight. The Romanesque Duomo and the later, adjacent Torre Ghirlandaia are outstanding, and are a UNESCO World Heritage Site. The Piazza Grande is one of the most beautiful squares in Italy, with the Duomo and town hall – the Palazzo Comunale – facing it. Modena is also one of Italy’s two main car manufacturing centres, along with Turin. Fans of the Formula 1 Ferrari marque have two museums to choose from. The Museo Enzo Ferrari in the city centre covers the life of the company’s founder, while racing car aficionados should head for the Ferrari Museum in Maranello, 18 km (11 miles) from Modena, where you can see Ferraris from vintage models to the present day. You can also drive in an F1 simulator along a track or enjoy a simulated pit stop. If you’re visiting the Museum in Maranello, you can also book yourself on the Ferrari factory tour, which includes a trip to the Fiorano test track. Places on this tour are limited, as only two tours run each day, at 1230 and 1330. Getting from Bologna to Maranello is easy, with regular buses from Modena to the town. Alternatively, it’s possible to book Ferrari tours from Bologna, which include both museums. Getting there: Getting from Bologna to Modena by train is as easy as it gets, and there are regular buses – taking 30-40 minutes – to Maranello from there. Reggio Emilia – also sometimes called Reggio nell’Emilia – tends to get overlooked by visitors as it’s overshadowed by Modena and Parma. It’s actually a lovely small Italian city with a beautiful old town with several fine squares and arcaded streets. Piazza Prampolini is one of the finest, and it’s the site of the city’s Duomo (cathedral). The churches of San Prospero and Beata Vergine della Ghiara are also well worth a visit. Interestingly, a group of Australian pre-school teachers we know visited Reggio Emilia, as it’s where an approach to child learning originated. They didn’t really get to visit anywhere else, but were blown away by the beauty of the city. It’s definitely worth a look. Getting there: The journey by train from Bologna to Reggio Emilia is easy, between 25 and 40 minutes. Parma, like Bologna, is one of the best destinations in Italy for food lovers. Yet there are plenty of other things to do in Parma, the home town of composer Giuseppe Verdi, with a gorgeous historic centre to explore. The stunning pink marble Baptistery (Battistero) is one of the icons of the city, even better-known than the Duomo (Cathedral) to which it’s attached. The Piazza del Duomo is one of the most magnificent squares in Italy, the one absolute must-see in Parma. Parma’s centro storico is fairly compact, with most sights within walking distance. The Galleria Nazionale di Parma is the city’s main art gallery, with an outstanding collection including works by Leonardo da Vinci, van Dyck and Canaletto, to name just a few. It’s housed in the Palazzo della Pilotta, which also includes two other museums and the splendid Teatro Farnese. It would be remiss to leave Parma without going on some sort of food tour in Parma, whether guided or self-guided. You can explore the many delis and restaurants around the city by yourself. Otherwise, various food tours in Parma offer trips including Parmigiano Reggiano cheese tasting and Parma ham tasting, where you also get to learn about the production involved bringing these delicacies to the table. Getting there: The fast train from Bologna to Parma takes 50 minutes, with the regionale taking only 1 hour and 15 minutes, so it’s within easy reach. Ferrara is yet another medieval gem, a city that grew around the powerful Este dynasty in the Middle Ages. Their legacy lives on in the Castello Estense, one of their main residences and one of the best things to see in Ferrara. It has an imposing exterior and the interior is a mixture of plush, opulent apartments and dingy dungeons. Ferrara’s heyday was during the 15th and 16th century Renaissance period, when the likes of Michelangelo, Mantegna and Piero della Francesca worked there. The Este family amassed a magnificent art collection, an example that was later followed by their Florentine rivals, the Medici. Much of the city was planned and built during this time, including the spectacular town walls, which became the model for others around Europe. Much of the city is a designated UNESCO World Heritage Site, which also includes the nearby Po river delta. There are enough things to do in Ferrara to warrant a stay of a night or two, or even to use it as a base to explore the region. It also has a beautiful Romanesque cathedral and adjacent museum, as well as an excellent art gallery in the Palazzo Diamanti, another Este residence. Getting there: Regular trains make the short journey between Bologna and Ferrara. The Ravenna mosaics are among the best-known religious art in the world. The history of Ravenna is extraordinary. It grew to become the western capital of the Holy Roman Empire, which was ruled from Byzantium (Constantinople, now Istanbul), and it became very wealthy as a result. Its collection of early Christian mosaics is the richest in the world, and collectively they are a UNESCO World Heritage Site. They are astounding – I’d go so far as to say they’re one of the top ten things to see in Italy. They are at six different sites around Ravenna – the Basilica of San Vitale, the Neonian and Arian Baptisteries, the Mausoleum of Galla Placidia, and the Basilicas of Sant’Apollinare Nuovo and Sant’Apollinare in Classe. Getting there: It’s easy to get from Bologna to Ravenna by train – the slow, cheap regionale gets you there in an hour and twenty minutes. A day trip to Rimini from Bologna also gives you a taste of something very different – a slice of Italian beach life at the country’s largest beach resort. Family holidays to Rimini are a huge tradition in Italy. I’ve met families who’ve been coming back to the same hotel for 30 years. This Adriatic seaside resort has 9 miles (15 km) of beach, most of which is divided into numbered sections. Each bagno rents out sun loungers, umbrellas and use of facilities to visitors – some have Jacuzzis, others are more basic. There are also a few sections of free beach, including around the port. The Bologna to Rimini train is a quick run of around an hour, and if you head out of the station in the opposite direction to the beach you’ll soon find that there are other things to do in Rimini besides soaking up the sun. Rimini was an important Roman town, and it has some amazing sites including the 1st century AD Arco di Augusto and the Domus del Chirurgo, the Surgeon’s House, an archaeological site that’s still revealing its ancient secrets. Rimini is also home to an unfinished wonder of the Renaissance, the Tempio Malatestiano. The city’s grand cathedral was never completed as the nobleman who commissioned it, Sigismondo Pandolfo Malatesta, ran out of funds. But it’s still very impressive, especially the huge marble façade and the frescoes by Piero della Francesca and Giotto. Getting there – direct train from Bologna to Rimini. Predappio is a small town in the Sangiovese wine region of south-east Romagna that would probably get very few visitors. The only reason it gets a small but steady stream of people is that it happens to be the birthplace of the Fascist dictator, Benito Mussolini. Mussolini and Fascism aren’t quite as beyond the pale in Italy as Hitler is in Germany. You can walk into a souvenir shop and buy all kinds of Fascist paraphernalia and memorabilia, and you can visit his tomb in the nearby cemetery. Visiting somewhere like this is a bizarre experience. The church where Spanish dictator Franco is buried, in the Valley of the Fallen near Madrid, is similar. It’s an alternative reality, where someone who brutally suppressed opponents and instigated laws discriminating against Jews and Africans is almost venerated. In a world where alternative facts are propagated, you need to visit somewhere like this to confront the madness. You should also try to watch Charlie Chaplin’s first ‘talkie’, The Great Dictator, to see the hilarious lampooning of Mussolini through the character Benzoni Napaloni, the Dictator of Bacteria. Many in Predappio are deeply uncomfortable about the association with Mussolini, and the local authorities are trying to establish a Museum of Fascism, documenting the political movement and showing its abuses, to provide a more balanced view of an era Italy has always found difficult to fully confront. This is scheduled to open in 2019. Getting there: One option is to consider car rental in Bologna, and combine it with San Marino for a day trip. Alternatively, regular trains run from Bologna to Forli, from where you can catch a bus to Predappio. The independent country of San Marino is a tiny landlocked state a few miles inland from Rimini. It’s the fifth smallest country on the planet, the only city-state in Italy to retain its independence – something it has done, remarkably, since 301 AD. It’s a funny little place. Most visitors head for the city of San Marino, on the upper slopes of Monte Titano. The most impressive sights are the Rocca Guaita fortress and Torre Cesta tower on the precarious mountain summit. Otherwise, you can see the ceremonial Changing of the Guard during the summer months, or go shopping in San Marino for rare postage stamps. It’s possible to get from Bologna to San Marino and back on a day trip, though it’s at the limits of where you can realistically reach on public transport. If you’re driving, it can be combined with Predappio on a most intriguing day out. Our Rating: 4/5 on its own, 5/5 if combined with Predappio and nearby San Leo. Getting there: If travelling by public transport, you need to get a train from Bologna to Rimini, which averages at a little over an hour, then an onward bus (another hour) from Rimini to San Marino. Alternatively, if you’re driving, the A14 or SS9 run parallel to each other from the outskirts of Bologna to Rimini, and from there you take the SS72 up to San Marino. A day trip to Florence is a definite option, especially if you’re just planning to visit a few locations there, such as the Accademia gallery or the Uffizi. There are too many things to see in Florence to cover in a day trip, but if you’ve missed something on a previous visit, it’s well worth considering, especially as the Bologna to Florence train takes just 34 minutes. If this is your first time in Florence, it’s definitely worth considering Florence day tours, which would give you an overview of the city. 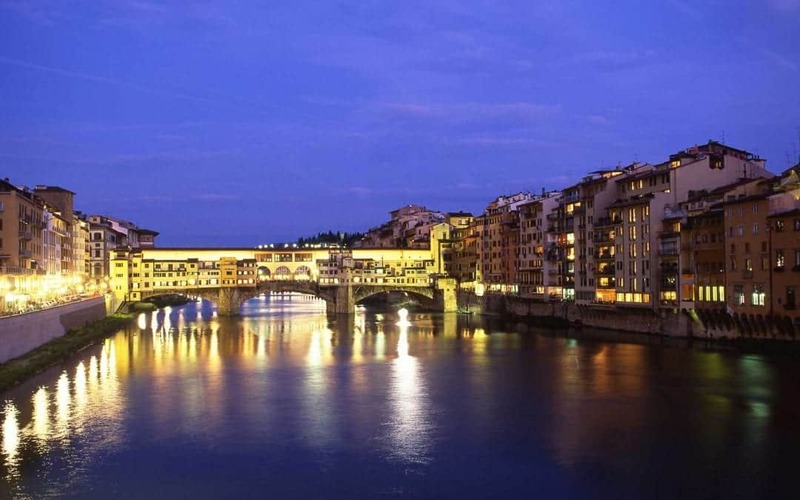 You can also book ‘skip the line’ tours of the Accademia and Uffizi and walking tours, which include the Duomo (cathedral), Piazza della Signoria and the famous Ponte Vecchio bridge. I’ve stayed in and close to Florence on different trips, and used day trips to Florence to see places I hadn’t had time to see on earlier visits, including the Cappelle Medicee in San Lorenzo church and the Bargello, another outstanding gallery. Getting there – direct trains from Bologna to Florence are frequent, especially with new operators like Italo offering competition to the state railway. The 34-minute journey is by high speed train, costing between €17-26, depending on the time you travel. Don’t bother with regionale trains, you could end up taking four times longer (over two hours) to make the journey one way.